Having previously gone up. Now it’s time to go down! With my faithful-guide dog Fizz by my side (and guide-gal Vicky before her) I am able to travel to and around London with ease, the London Underground network is vast and with audio announcements and fantastic friendly staff (TfL) along with the odd app or 3 I have found I can stay largely independent in a network that often confuses those without additional needs. I was first made aware of ‘The Tube Challenge’ in September 2018. The challenge is to visit all 270 stations on the London Underground Tube network (not including dlr or overground) in the fastest time possible. The current Guinness world record is held by Andi James, who completes the challenge in the fasted recorded time of 15 hours 45 minutes 38 seconds. So when I asked if the challenge could be done with a disability, he took it onboard and now we are here. 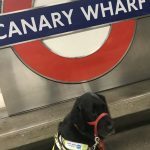 On Friday 11th January 2019, along with Andi James as my sighted guide I will be aiming to complete The Tube Challenge. Given the nature of the challenge, the endurance aspect and the travel, the public and the timings. This is one day of tube travel where I will not have my guide dog with me. Fizz will be enjoying the rest with her paws up, while I achieve my goal. This in itself adds additional elements to completing the challenge with my cane and sighted guide. We shall be starting early on the Friday morning, traveling through rush hour, navigating the tube network, swapping between lines that will see us travel above ground in addition to under it, traveling around some of the networks busiest station, heading through evening rush hour and the weekend get-away to achieve this. All parts of which will hold its own challenges. The gauntlet has been laid down, the planning has begun. And now is where I ask for your support. In addition to achieving this I wish to raise awareness of the freedom my guide dogs have given me. It is in memory of my first guide dog Vicky that I wish to do this. She sadly passed over the rainbow bridge on 2nd January 2018; having hung up her harness on 19th January 2015 when Fizz stepped into her paws. And in raising awareness, I wish to raise money to name a guide dog puppy, a name that will mark the occasion. A few names have been put forward once they are agreed I shall update this page accordingly. London just got A WHOLE LOT Easier! Today I made my first trip of the year into London. After all, have dog; will travel still stands. Even more so when a return ticket costs just over £10! So, 2 hours on a direct train to London Victoria and then to get the tube to meet friends. Something in the past that I have dreaded a little from London Victoria, but not anymore. Because as THE busiest tube station on the entire underground network, Victoria is now ACCESSIBLE. So, it’s not quite so straightforward, and it isn’t the easiest of ways to navigate. But all the same, Victoria now has a new North Entrance; which offers step free access (via lift) from street level to tube. I say it isn’t straightforward because the entrance to the accessible part of the underground isn’t within London Victoria Railway Station, rather it is up the road on the outside by a fairly new shopping area on Victoria Street. And then once you find the street level lift area, it is then a series of lifts to get down to the deep level of the district/central line, before changing to a 3rd lift to go even further under to reach the Victoria Line. This multi-lift approach is very similar to the confusion that is Kings Cross, however (thankfully) the lifts have really clear white on blue signage indicating which lift to take to which level. And as always, helpful and friendly TFL staff more than happy to help. So, no more dreading this particular tube station and a whole world of possibilities opening up to me without the need to walk on switched off escalators (which isn’t actually always possible when it’s peak time!) with their steeper treads and length distances. To some this may not seem much, but to others this will help reduce some of the ‘additional’ stresses that London can pose.